The Polk County Republican Club had a fish fry, auction, and a key note speaker at a fundraiser held on Thursday night in the Polk County Commerce Center. 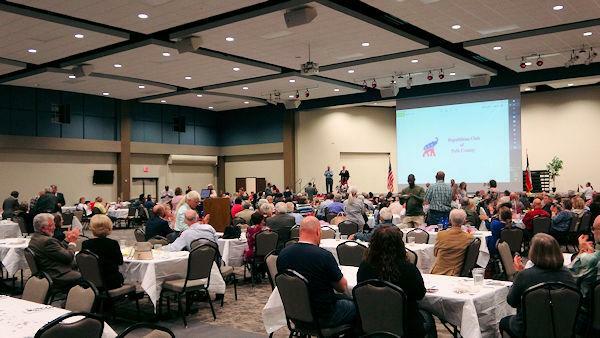 Allen West and Congressman Brian Babin Attend Republican Club, LIVINGSTON, March 22, 2019 - On Thursday night (03/21/19), the Polk County Republican Club held a fish fry and auction to raise money. Every elected Republican in Polk County, it seems, was in attendance. There were local elected Republicans, and just lots of Republicans period. Local Republican, Tommy Coleman presided over the event and got assistance from other local and non-local Republicans. Breitbart News' Bob Price gave a speech. Justice of the Peace, Darrell Longino served as the auctioneer, and there were door prizes. The two big highlights of the evening were Congressman Brian Babin paying honor to five World War II veterans who reside in Polk County, and keynote speaker, nationally renowned Republican, Colonel Allen B. West. West spoke about the importance of Texas remaining in the Republican column and that Texas is the key state in presidential elections. Both Babin's presentation and West's keynote speech were taped by PolkCountyToday.com and linked below for your convenience.